1981 Commences business under the name "Nortrak Railway Supply Ltd.", supplying railroad track components, both new and used, from its British Columbia, Canada location. 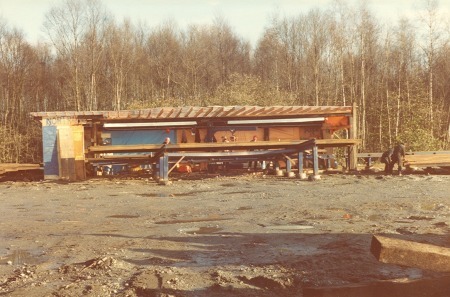 1983 Nortrak manufactures trackwork for the first time at its Richmond, BC, Canada facility. 1990 Voest-Alpine Eisenbahnsysteme of Austria enters the North American market by purchasing a share-holding in Nortrak. Nortrak changes its name to VAE Nortrak Ltd.
Voest-Alpine Eisenbahnsysteme has evolved into a company called voestalpine VAE GmbH, a wholly owned subsidiary of the Austrian conglomerate, voestalpine AG. voestalpine VAE GmbH is a key component of voestalpine's Metal Engineering Division. 1992 Opening of VAE Nortrak's second manufacturing plant in Birmingham, AL. 1996 Opening of VAE Nortrak's third manufacturing plant in Cheyenne, WY with ground breaking ceremony in October. 2000 Cheyenne, WY facilitiy added a 37,500 sq ft plate shop to its operation. 2004 Acquisition of the assets and business of Meridian Rail Track Products Corp., with operationis in Pueblo, CO, Newton, KS, and Chicago Heights, IL. At that time Meridian was the largest supplier of trackwork into the North American market. 2004 Acquisition of the assets and business of Rail Products and Fabrication Inc., including a trackwork manufacturing facility and manganese foundtry in Seattle, WA. 2007 Purchase of two buildings from the City of Cheyenne, expanding its covered manufacturing area there to 154,700 sq ft; Establishment of VAE Nortrak's Concrete Turnout Tie manufacturing facility in Cheyenne, WY in one of the newly acquired buildings totaling 65,500 sq ft. The second acquired building was the previously leased plate shop of 37,500 sq ft.
2007 Purchase by voestalpine VAE GmbH of the minority shareholding in VAE Nortrak, making the company a wholly owned subsidiary. 2008 Acquisition of a majority shareholding in DAMY Cambios de Via, S.A. de C.V. DAMY, located in Guadalajara, Mexico. Having been in the business for over 40 years, DAMY is the leading supplier of trackwork to the Mexican market with a reputation for high levels of quality and customer service. The company changes its name to Nortrak-Damy Cambios de Via, S.A.P.I. de C.V.
2009 Acquisition of the assets and business of Leading Edge Enterprises Inc. of Decatur, IL. This facility, now operating under the voestalpine Nortrak banner, offers wide ranges of cast ductile iron and manganese steel products as well as injection molded plastic items. 2012 Corporate name change to voestalpine Nortrak, to reflect long standing ultimate shareholding. Throughout its history voestalpine Nortrak has sought to satisfy its customers' needs by consistently expanding its range of high technology products and services. Its inegration in the 1990's into the VAE group of companies was a major milestone ini this regard. With voestalpine Nortrak's parent company, voestalpine VAE GmbH, having been in the trackwork industry for over 160 years and with sister subsidiaries in some 26 countries world-wide, voestalpine Nortrak is uniquely placed in the North American market, being able to offer its customers the beneift of the VAE Group's broad-based, deeply historic, yet up-to-date knowledge and experience.